Unilever, internationally, does a brilliant job of managing their Facebook presence and activities for Dove under one consolidated zone which boasts of 8.6m fans. I would regard this as a best practice for a running a brand page - Create a mother page which brings together all your sub brands, variants, local initiatives and short term promos. It helps at various levels. For users this is one page they need to go to for all social media activities of the brand they love and for the brand it’s a resource effective way to create a critical mass of content and engage their consumers. 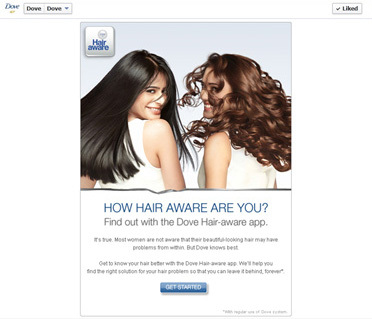 Currently, Dove in India, is promoting the new Hair Aware application. The idea is for women to understand their hair problems by answering simple questions about their everyday hair care routines and for Dove to share related solutions. 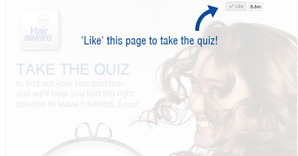 The bug ridden application keeps asking you to ‘Like’ the page to take the quiz (even when you are an existing Dove fan) and never really shows up the quiz page – I checked it on 3 browsers. Oh well! All the best practice raving aside, maybe being a little ‘aware’ness of what you put out there would really help.